I didn’t really know what to expect at Cochon 555, but I didn’ t expect THIS. Excited as I was for the event in Vail, I couldn’t picture it. Then, once I arrived, everything was moving and shaking and begging for attention, and I had to saddle up for the ride–which began before we even entered the room, when an ice-laden bar offering oysters on the half shell popped up just past coat check. I had only a moment to think ‘that’s odd’ because then, to my right, a man materialized offering me “The Perfect Manhattan.” Sensing my hesitation, he did what any competent bartender would do and started pouring and shaking. Then, there I was, walking into the main room (that’s right, we weren’t even inside yet), clutching a Mason jar full of bourbon-infused rocket fuel. One sip was all it took; I would have orbited directly to another galaxy, missing the event entirely if I’d drank it down to the cherries. The rest of the evening surreally followed suit–everywhere I turned, someone was offering to fill my glass or my plate with something incredible. It was overwhelming, but like an eager college freshman at the activities fair, I was determined to get fully involved in all the evening had to offer. 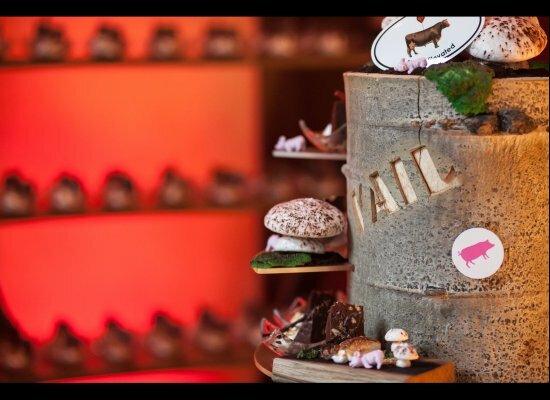 To refresh your memory: Cochon 555 is celebration of heritage-breed pigs, as well as the farmers who raise them and the food industry folks that source them. 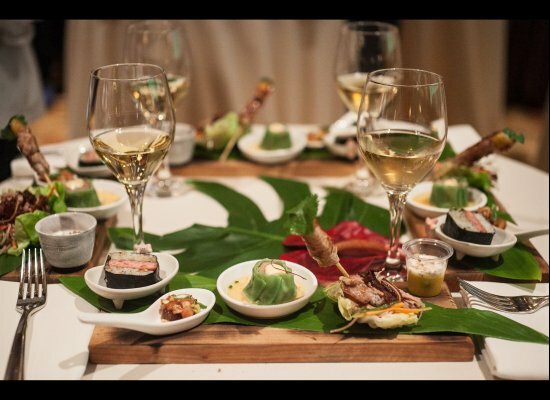 It takes the form of a traveling culinary competition and tasting event, with events nationwide where five local chefs compete in their preparation of a menu from the entirety of one 200 pound family-raised heritage breed of pig, snout-to-tail. Chefs mingle with mixologists who mingle with butchers who mingle with cheesemongers who mingle with people like me, and everyone helps spread the word that farmers who raise these succulent swine should be supported and shops who carry the goods should be frequented. Back to Vail’s event. After I ‘accidently’ left my perfect Manhattan on a table, I tightened my bootstraps and set about my business of eating pork. After one more small detour. At the front of the room, chef Bill Greenwood of Beano’s Cabin was treating guests to a visual masterpiece: a real live butchering demonstration! The pig? Large Black. The tools? Hand saws and knives. Very sharp knives. The bummer? I dropped the ball on buying a $15 raffle ticket to win the whole hog! 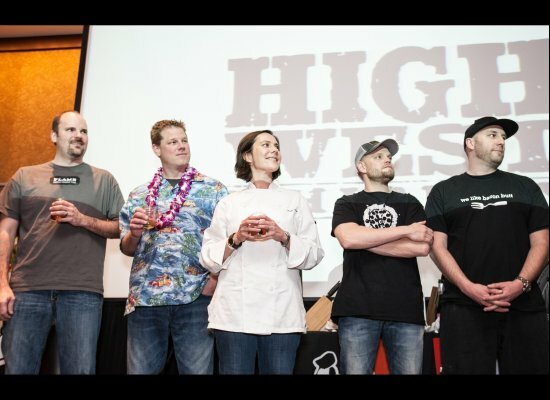 Good thing I had a backup plan–go eat an entire pig myself, as prepared by five of Colorado’s best chefs. Phew. Here, I offer you my ten-cent tour. First up, Kelly Liken, the lone chica in the club. She and her Vail crew created a super-chill, street foody vibe. No big fancy display, just yummy approachable grub that one dreams of finding in a beachside pueblito in Mexico or on a crowded Thai street corner. Highlights? Lime spiced chicharrones (not easy to find an actually edible version of these oft-bastardized crunchers) and the crowd-pleasing “Eastern Carolina BBQ with Tasso Hush Puppy and Pork Honey Butter.” Bam! Kelly was surrounded by friends and family all evening, and her sweet husband clutched a bouquet of flowers for her as the awards were announced. Next, Lon Symensma. Major kudos for the thoughtfulness in his presentation of pork. He invited guests to travel the pages of his passport (the one from his 20s, when he was unburdened by the demands of life and women), sampling traditional and original takes on the cuisine of Italy, Malaysia, Spain, and the US of A. 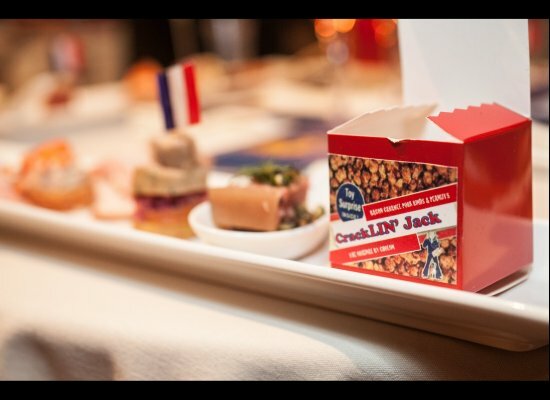 For the latter, he and his (incredibly sweet) crew painstakingly packaged up “Cracklin’ Jack” (bits of salty/bacony/caramelly pork rinds and peanuts) in adorable little red, white, and blue boxes. Can you guess the toy at the bottom? In “Italy,” Lon also introduced me to head cheese (contains head) and coppa (contained heart and kidney). Because I am fresh off a blissed-out Hawaiian holiday, I practically squealed at Alex Seidel’s homage to the happiest state. He was quick to assure me that the “Pork Face ‘Spam’ Musubi” did not contain actual Spam, but I was quick to assure him that I understood the cultural implications of Spam in Hawaii and loved his audacity. I’m positive that a Hawaiian cuisine connoisseur would have been blown away by his attention to detail and authenticity; the Kalua Roasted Pork Shank was spot on, and the “Pork Belly vs Tuna Belly” playfully united Hawaii’s most prevalent proteins. Then on to Blackbelly, under the fun-loving leadership of Hosea Rosenberg. These guys brought Boulder to Cochon 555 with their simple, farmhouse-style offerings laid out in a display that looked entirely compostable. It was here that I tasted aspic for the first time, as well as pig liver (which was perfectly packaged in a delicate dumpling). Hosea’s bone broth was exactly as bone broth should be–dark and rick and earthy–and it is what I will ask him to make for me at the first sniffly, scratchy onset of a cold every winter. Finally, I made it to Jason Harrison’s table, where my belly posted a “No Vacancy” sign and blocked all points of entry. It broke my heart to pass by the savory, but I think I made the right choice by only sampling the sweet. The “S’mores with bacon graham cracker, lardo fudge, candied belly, pecans, rind marshmallow” was phenomenal. Jeans were unbuttoned. And Harrison won! Lest you think my pants got tighter from eating pork alone, I remind you that for every chef’s display, there were three times as many alcoholic offerings (beer, bourbon, mezcal, and wine) and just as much cheese. Yes, cheese. Coral and Will Frischkorn of Cured brought up a lovely spread from Boulder and saw people trickle over for pork palate cleansers. At some point in the evening, I wandered over to a tartare bar, which I (wrongly) assumed was dishing up raw pork; who knew that cow was invited to the party, too! 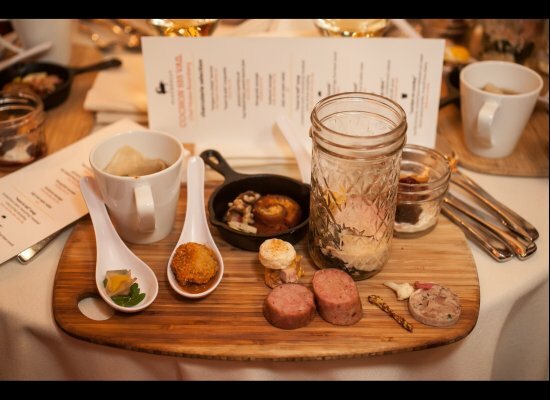 I kept trying to be done eating and drinking, but the Cochon 555 dudes would not abide. There was a late-night Heritage BBQ sponsered by Vail Chef Julian Smith for which I managed to locate some abdominal real estate, and pink champagne and chocolate flowed freely during the awards ceremony. In a few months, Jason Harrison and his crew from Flame will mosey on over to Aspen, where they’ll duke it out with other Cochon 555 winners from around the country for the title of “Prince–or princess–of Porc” at the Food and Wine Classic. Until then, you can still catch the tour in DC, San Fran, Miami, Chicago, and LA. (Don’t worry about air travel anxiety; you’ll be in a food coma for the flight home). Stuck in Colorado? Eat at the restaurants that care about flavorful and responsibly-raised pork and buy the same stuff to throw on your grill or in the oven. Together, we can taste our way toward a more sustainable food system and boast of the best bacon around.